"M" is for My Meringue Meltdown or My Misadventures in Meringue Making"
I set out to duplicate a cute ice cream cone made with pretty meringues that I had seen in the February 2010 issue of the magazine Better Homes and Gardens. 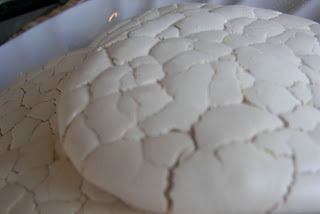 Yes, I know all the rage is French Macarons with almond flour, but I wanted to make meringues. I could have used store-bought meringues like they did in the magazine article, but NO I attempted to make my own! 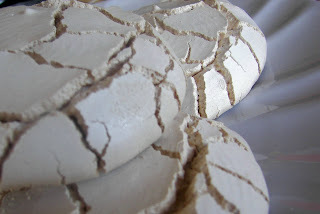 My daughter Tati made meringues with little trouble which you can see here. This was her first attempt and they turned out wonderfully. Armed with a similar recipe to Tati's, I made my first attempt. They turned out wonderfully and I was so thrilled to see their heighth and their FEET -- that is the bottom part of the meringue. Feat (feet) accomplished! 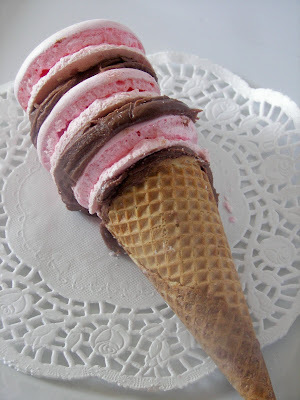 So I assembled the pink meringues into a beautiful ice cream cone. So I thought, "I would like to make some more meringues in a beautiful pale yellow shade." THEN THINGS IN THE KITCHEN BEGAN TO GET UGLY! So here is my beautiful second attempt at meringues. My husband walked in the room and said "WHAT happened to those?" So obsessed with achieving perfection, I altered the recipe and procedures a bit and began MY THIRD attempt in one day of meringues. My lovely husband looked at those and said, "They are a little flat!" Thank you for that information! I am surprised he didn't pick one up and throw it like a Frisbee! Yes, I AM a slow learner! But still not undaunted by failure and still somewhat encouraged by my first attempt, I began (yes, it is still the same day!) my fourth attempt. You may need a hankie when you see these! My beautiful and accomplished sister in food blogging traitorous daughter remarked that they would be cool if you were giving a birthday party about the desert!! Think dry ground crackled by lack of water. We did give a "Holes" birthday party once for my son. "Too bad we didn't have these cookies for that party!" I thought to myself in a very snarky voice! Now, it has become an obsession and I make my fifth attempt. Why not go back to the yellow buttery look. By then, I am NOT even watching them in the oven. I have slumped away from the kitchen and am consoling myself in blogland. My girls are still in the kitchen and they tell me that at least they are NOT cracked this time! 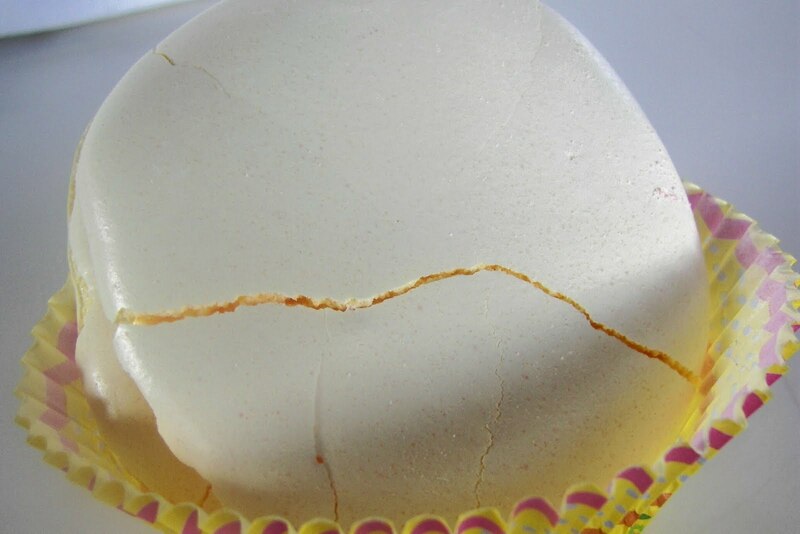 Can you look at these and NOT see cracks!!!! So by then it was time to go to my son's soccer game. No I did NOT miss my son's game! I controlled my obsessive behavior and went to his game and DID NOT make any more attempts to make meringues that day. I think five times was enough! 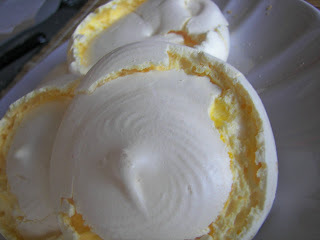 I was consoling myself that at least sugar and eggs, the main ingredients in meringues, were cheap. I expressed to my husband that at least I had not tried to make French Macarons because they are more expensive to make because of the almond flour. His very kind unkind remark was that, "Well, at least the failures would taste good!" I tell you! I get no respect in the kitchen! The weird and sad thing is that I couldn't tell you what I did different in the first attempt that made the first meringues turn our right! I am kindly not giving you the recipe! WHAT...did you want it? 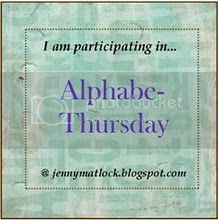 I am participating at Jenny Matlock's Alphabe-Thursday where the letter of the week is "M." You can join in on more "M" fun by clicking on the logo below. Never tried to make meringues...now I won't. Just popping in from my blog's UBP10 to say Hi. That ice cream cone is unbelievably clever! Wonderfully delicious M!! Marvelously clever! I like this post very much! Meringues are so tempermental. I applaud your continued attempts. I would have quit after the first failure. MMMM I want some meringues now. I am thinking a weather problem, did it start to rain or was here a change of rain in the air. I make divinity and the first batch might be perfect and then I try again and it flops! Sometimes you need to wait a day and then try again. OH you tried sooo hard! You certainly get an A+ for effort!! I chuckled at your story and some of your photos. You have perseverance and courage to even try to make meringue. Not my idea of fun! Your ice cream cone is delightful. I was going to say the same as mrs C, humidity and/or dampness causes problems, they are finickity little critters! Fabulous post, your persistence is commendable, if a little nutty! That is right, as long as they tasted good in the end...hours and hours later..but at least you tried! More than I can say! Thanks for stopping over. The ice cream cone looks perfect. Sorry, about the rest of your tries. I'm not a baker so don't have a clue what happened to the others. You seem determined though and I'm sure you'll figure it out. I have also never tried meringues in any form. I know it would be disaster so I don't try! Love your beach tablescape too, I need to try something like that! They look so wonderful. I love how the melt in your mouth. Wow, isn't that just weird that the first one turned out perfectly? That is a good word. So perhaps we can figure out the reason why such discrepancies would occur in science class! But until the science teacher arrives I will just thank you for a marvelous stop on my little trip today through Alphabe-Thursday's letter "M"! The "sandwiches" and that cone-full are absolutely beautiful! ...and the others still make my mouth water! Hey, ya gotta chew 'em up anyway!!! I invite you to check out my Mini Cupcake PinCushions! 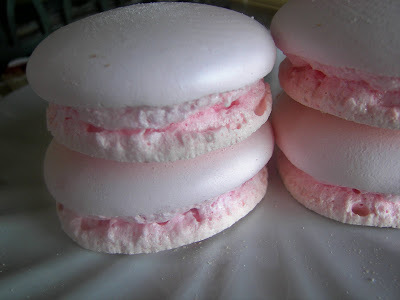 Oh I know meringues can be uncooperative and macaroons even more so! Did you put a drop of vinegar in the meringue mixture? I learned that trick long ago and it helps. Also wet weather can sometimes ruin meringues, or a sudden change in temperature while baking ( no opening the oven door to peek! Oh, the pink meringues were so lovely and look deliciously delightful in the cone. I so wish I could help with the others, but I have a burnt thumb in the kitchen. But as Scarlet says tomorrow is another day. I'm always hopeful that some cosmic alignment will make a recipe work better another day. Btw your mango ice cream balls look amazing. I'm sorry, but I just had to laugh. Your attempts brought back a Thanksgiving Day dinner memory for me. It was around 1974 and I was having 14 people for dinner. I wanted to make apple pie and kept having trouble with the pie crust. What a mess. I kept running to the store for more ingredients and I kept throwing each attempt out. Finally, with my fourth attempt I threw the stainless steel mixing bowl on the floor in a fit of rage. I still have that mixing bowl with the dent as a reminder to always buy the Pillsbury all ready made crust. I so do not have the patience to keep trying. I would have quit at the perfect pink ones and called it a day. YOU.ARE.MY.HERO! Making a note never to try making those finiky creations; but I hope you have better luck next time! The first ones were so lovely :) . Meringues are so finicky! Hats off to you for trying again...and again...Because lord knows I would have given up!